It was only 72 hours ago I was on Haitian soil. I have the vivid memories and the jet lag to prove it. 48 hours ago, on Tucson soil, Pastor Greg preached out of Acts 11 about the Antioch church and our call to be a church on God's multiplying mission. The sermon hadn't been planned to coincide with the return of our team, but the timing couldn't have been more perfect. I'll return to Antioch in a second, but first let me share about a little about our trip. We had two primary objectives in our partnership with Cross to Light Ministries. The first was that we led a group of students through a week-long study of the book of Job (this study filled our mornings). The second was that we hosted medical clinics in the afternoon. By God's grace, both were successful. 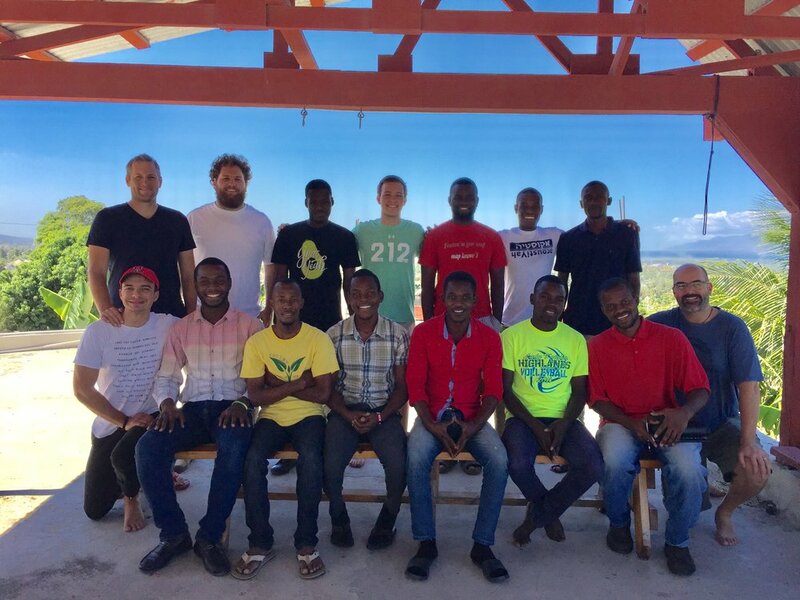 We had the incredible blessing of meeting a brand new group of seven students: eager potential pastors, hand-chosen by pastors who had previously graduated from Cross to Light. Their curriculum is Bible-based and we jumped right into the deep end with them, covering the challenging book of Job in their first week of class. They debated where we could find truth in Job's friends' responses, in the faithfulness of Job's own responses, and the meaning of God's final response. And then we dug deep into what the book taught us as future pastors: what does it look for us to walk well with those who are suffering? Over the course of the week we were blessed to have another six of the former students who are now serving as pastors join us for portions of the study. Both the current and the former students displayed a passion for Jesus Christ, commitment to the church, and love of their country. It was truly a privilege to meet these current and future leaders of Haiti. These are truly remarkable men. They reflect the radical faith and obedience of the founder of Cross to Light, Brian McDaniel. Every story Brian told us made your jaw drop: from his call to Haiti, to remarkable salvation stories, to God breaking demonic powers, to visions. But Brian and the students would be the first to let you know that is not because of how remarkable they are, it is because how remarkable our sovereign God is. In the Acts 11 text, the Antioch church, which had only just received the gospel themselves, becomes a launching pad for the gospel. Antioch-- a town of no worldly notoriety: not a strategic political or military location -- would become the most important location for the launch of Christianity. It was in Antioch that the followers of Jesus took the pejorative name "Christian" thrown at them and owned it. And it was from Antioch that all of Paul's missionary journeys were funded and launched. These journeys would change the world. The power of missions is found not in the missionary but in the mission, and even more, the one who sends us on mission. We were blessed to have my friend Ben Henrie, who serves as a missionary to Haiti with another organization, join our team for three days. Ben's presence reminded me of this truth. Ben's own testimony is that it took seven years for God to soften his heart to serve full-time in Haiti. For years he pushed back on God's call, content with serving short-term in Haiti. And Ben might not be the first person you would think would thrive as a missionary in Haiti-- working in a facilities role in the United States, with a huge beard and a taste for cigars -- you might not be so sure about what role he would serve. But watching Ben in conversation, seeing him relate to pastors and children alike with an ease of the language and culture and a natural display of the love of Christ was a beautiful thing to watch first-hand. Ben is a perfect fit. He's a powerful instrument in God's hands. God loves mission. He loves using us on mission. There were huge sparks in my heart for Haiti on the trip. I so hope that it is the first of many trips to a beautiful country where God is doing incredible things. But God also sparked my heart for Tucson. Most of us live in Antioch: where the ordinariness of life can throw a wet blanket on our expectations for what God can do. The Bible is clear: if you are a Christian, you are a missionary. It is not an optional vocation, something for the truly remarkable Christians. And you have the incredible promise that what our God is about is taking the Antiochs, the Port au Princes, the Tucsons, and growing his kingdom by the power of his Spirit in those ordinary places through ordinary people. May his sparks fly upward and outward, from my heart and yours, from Port au Prince and Tucson. Burn, Spirit, burn. Use our obedience for your glory.